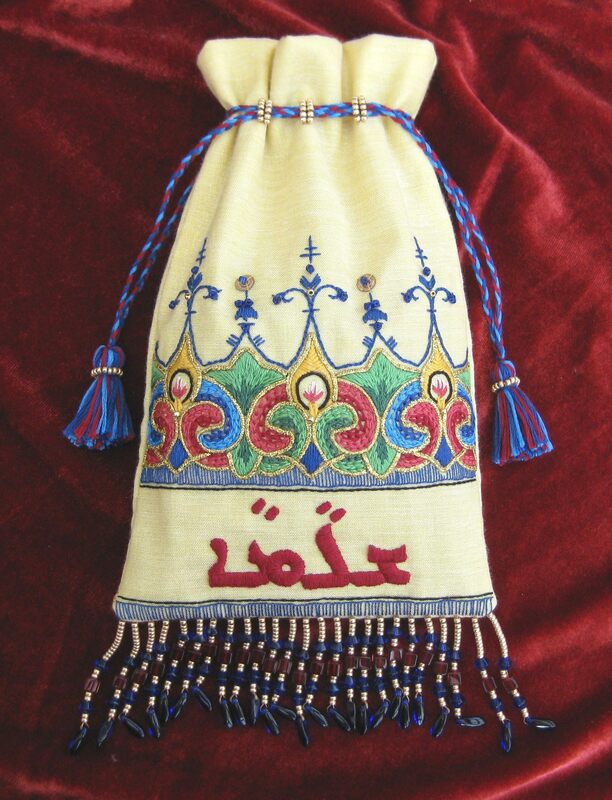 Finished embroidery – my Shlama bag is finally completed! This has taken me almost a year of so-called ‘spare time’ to complete, but I’m very pleased with how it’s turned out. It’s a drawstring bag to keep my MP3 player in, and measures 7 inches high by 4.5 inches wide, not including the fringe. I did a previous entry here about the progress of the stitching, when I was about half way through. 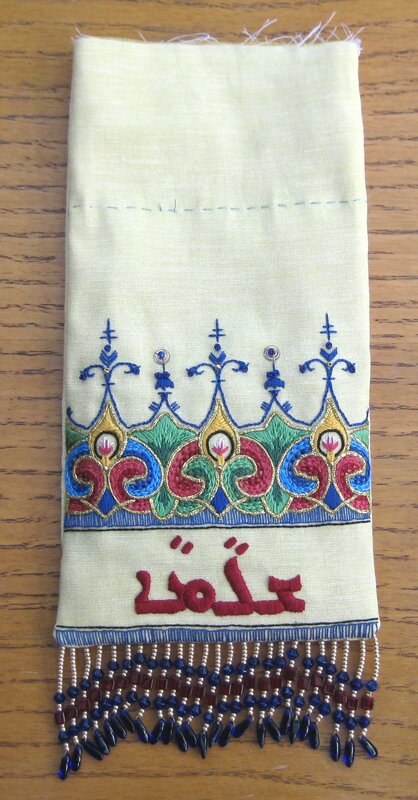 ‘Shlama’ is Aramaic (the language Jesus spoke) for ‘peace’ – it is the word that is embroidered across the lower part of the front panel, and is read from right to left. 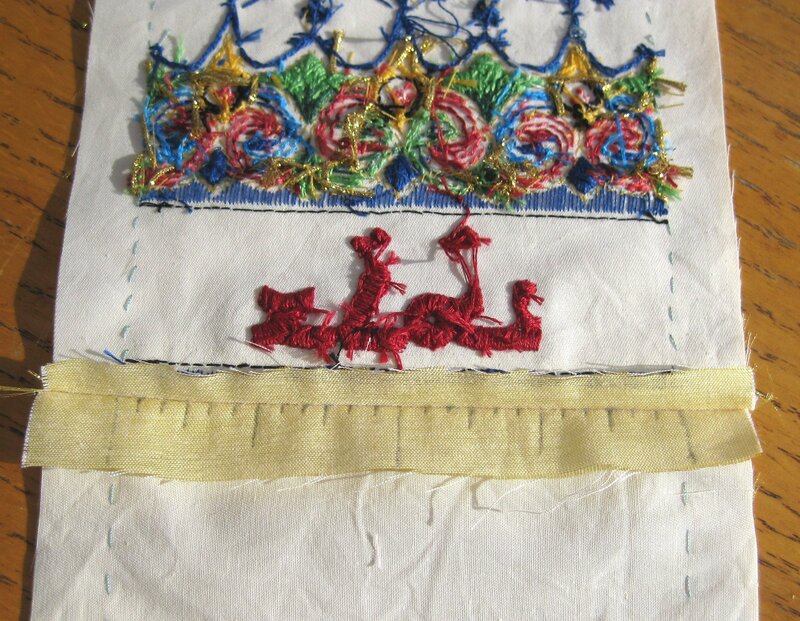 The stitches used include chain stitch, split stitch, long and short stitch, fly stitch and french knots. 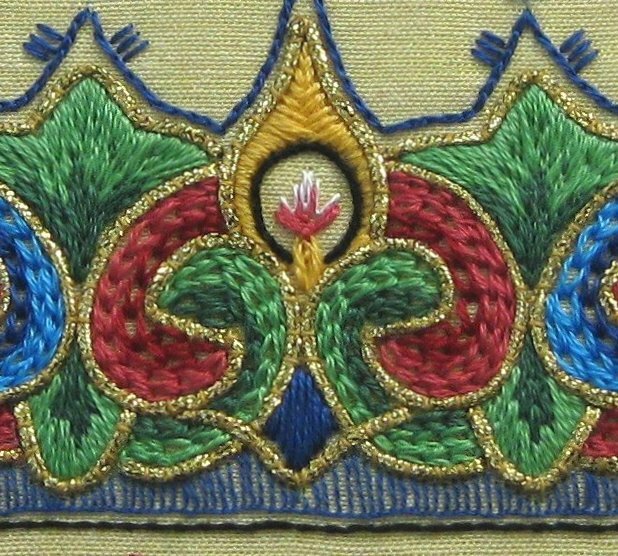 The gold Kreinik braid is couched down with silk thread. I added a few blue and gold seed beads and sequins, too. I couldn’t quite decide how I wanted to finish off the assembly of the bag, which is why it sat in the hoop on my tapestry frame for far too long! Eventually, I just had to get on with it, as I was fed up with seeing it sitting there, very flat and not at all bag-like. So, the first thing I did was cut out the front embroidered panel, and make a plain back panel the same size (lined with batiste, like the front, so that the weight would be the same). Then I stitched the bottom seam of the bag by machine, and pressed the seam open, grading the seam allowances. Next, I marked guidelines in pencil, to show exactly where the fringe needed to be stitched on. I made each fringe length separately, attaching it to the seam allowance exactly through the bottom seam. I more or less made up the fringe pattern as I went – the pattern of gold/blue/gold/red etc. stayed the same but I just added a few gold beads each time to the beginning of the fringe length to make the bottom edge shape graded. Then I stitched the side seams – the first two inches of each side I stitched by hand, in case the fringing might get caught in the seam, but after that I finished it by machine. I marked three points on the front and three on the back, an inch down from where the top edge was going to be, and stitched on two short lengths of seed beads at each of the three points, to make carrier loops for the drawstrings. Doing it at this point meant that no untidy stitching would show on the inside. Then, I put the lining in the bag, turned down the top edges, and slip-stitched them together. The lining was made from a small piece of scarlet shot silk which I’ve been hoarding for about 15 years for just such a purpose! The drawstrings were made from three lengths of Anchor thread, plaited together and then knotted to stop the ends from unravelling. The tassels were made by wrapping the same three shades around a piece of cardboard and then cutting the pieces all the same length, to make a bundle of two-inch pieces that I tied to the knotted plait ends, spreading them evenly around the plaits and folding them in half before tying them off again to finish the tassel, so that each completed tassel is about an inch long. 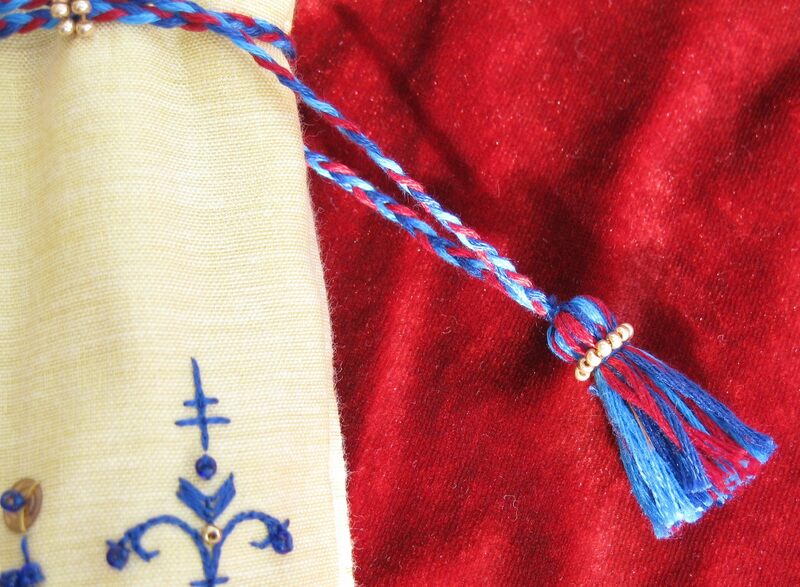 The tying-off thread was then hidden by stitching a ring of gold beads around the head of the tassel. With three layers of fabric on each side, the finished bag feels almost quilted, which is the effect I wanted – I need it to give a little protection to the MP3 player that I keep in it. I had originally intended the bag to have an inner pocket of some sort, to hold notes on the meditation tracks that I listen to on the player, but as I was putting it together, I realised that if I drew up the ties, then anything paper placed inside would get crumpled unless it was very small, so I abandoned that idea. I’m planning to make some kind of embroidered envelope folder, now, just for the meditation notes – any excuse to embroider something else! Author Janet GrangerPosted on March 3, 2010 March 5, 2012 Categories Aramaic, Shlama bag, StumpworkTags Aramaic, Beaded fringe, Beading, Beadwork, Embroidery, Finished embroidery, Hand embroidery, Stumpwork12 Comments on Finished embroidery – my Shlama bag is finally completed! I have been working on this bag on and off throughout the summer – I’m just about to have another spurt of activity on it, so I thought I’d post a couple of images here, before I do that. The fabric is a golden yellow shot silk, which I’ve backed with cotton batiste, to strengthen it, as areas of the stitching will be quite dense. I’m using Anchor stranded cotton for the stitching (two strands most of the time, and just one for the finer details), with Kreinik braid for the gold outlining. When the embroidery is completed, I’m planning to add tiny beads and sequins, and possibly a beaded fringe, in colours that echo the stitching. The motif was inspired by an Indo-Persian panel on a building, which I have ‘coloured in’ in deep jewel shades. The word embroidered in red along the base of the front panel reads ‘shlama’, which is Aramaic (the language Jesus spoke) for ‘deep abiding peace’. The word is read from right to left. The ‘dots’ indicate vowels. When it’s finished, the bag will have a drawstring about an inch down from the top. I haven’t yet decided what to embroider on the reverse of the bag – I may leave it plain, or I may stitch just the barest outlines of the main design again, simply outlined in split back stitch. 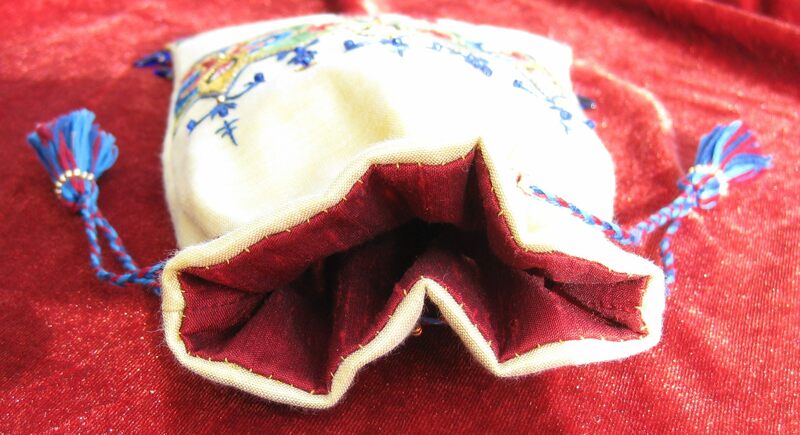 I want to use the finished embroidered bag to keep my MP3 player in. This might seem quite a large bag (5 x 8 inches) to keep an MP3 player in, but that’s because I want to be able to keep notes in it as well. I tend to use my MP3 player to listen to guided meditations and body prayers, so I need an index of what I have stored on the MP3 player, so that I can choose a relevant one – brief titles aren’t enough. So, I intend to make an inner pocket for the bag, so that the notes can be kept separate from the player itself. I haven’t yet worked out quite how to assemble the bag to incorporate that, but I’m sure it’ll work, somehow 🙂 !